On AiniA: It sure is hot in the Caribbean! We have arrived in St Thomas, US Virgin Islands after a 12 day passage from Virginia. Things worked out really well overall and we had an enjoyable passage that was certainly not relaxing but has given us even more confidence in Ainia's strength. Most of the time we were sailing very fast and when we going slower we were still heeled hard over. Ordi nary tasks became much harder because of the heel and motion as June shows in the galley. The fanny belt she is leaning against allows her to use both hands for cooking. Photos of waves just do not show up well. Sailing from the north-eastern US to the eastern Caribbean is a complex process that involves many different considerations. First is the balancing act between the risk of hurricanes on one hand and ordinary (but powerful) fall/winter storms. Leave too early and the hurricane risk goes up. Leave too late and fall storm risk goes up. Most insurance companies do not provide coverage for 'named storms' risks south of Cape Hatteras, NC until November 1st so that provides a starting point for waiting for the 'weather window'. Next is the decision about where to leave from. The big boats (70' plus) will often go from Newport, RI or another more northern port because they have the speed and fuel capacity to take advantage of a narrower weather window. South of Cape Hatteras the coast swings dramatically westward so you have to go further even though you have travelled to somewhere like Charleston, SC. The result is that most boats leave from Chesapeake Bay at the beginning of November. This includes the 65 boats that were part of the Caribbean 1500 rally/race to the BVI (we were thinking about going with them but it is about $2000). The trip can be divided into three sections. 1) Get across the Gulf Stream. This section is only about 150 miles but there is the potential for very nasty, and even dangerous, conditions in the Stream if the wind is from the NE (ie into the Stream). 2) Go southeast to 'I-66' - as it is called, 66 degrees west longitude near Bermuda. You want to get your 'easting' in before getting too far south. This section is about 400 miles. The weather in the last week of October and for November 1st had 15 to 20 knot NE winds in the Gulf Stream so a departure then was problematic (even if we were ready to go!). But for November 2nd a high pressure area was arriving that would turn the winds to the NW or even W. The problem was that the building high would also kill the winds for the days to follow. The trick was to ride the last of the winds from the preceding low and get southeast toward Bermuda before the wind quit. At least this was the apparent situation until the last few hours before departure when 'Waldo" appeared (more later). We had been visiting in Canada for the last week in October and picked up our crew, Marc in Toronto and Burry in Jersey City on November 1st (17 hours drive!). Next morning we rushed off to get money from the bank, buy last minute groceries (spent something $300 in 20 minutes, but forgot a few essentials like orange juice, milk and eggs - we did manage to remember to pick up six cases of beer though, and return the rental car. All of this happened by noon and we were off across southern Chesapeake Bay. A dinner time stop for fuel at the entrance to the Bay (in a little harbour that is home to US Navy amphibious operatioins) and we gone just as dark overtook us (it does get dark so early at this time of year). We reached the Stream much sooner than anticipated. It seemed closer than the forecast had suggested and we sailing fairly fast. We had marvellous sailing for the first few days and kept the winds - we thought we were able to outrun the advancing high, but something else was happening -- 'Waldo' was joining the dance. Waldo (my name) was a new, potentially very poweful low pressure system that was forming just to the north of our location. This low came to dominate the entire trip. Eventually the center of low pressure moved to southern Greenland with gale and storm conditions spread widely along a cold front that eventually extended almost as far south as Cuba. Waldo did not move eastward very much over the next week. This meant that we were never short of wind. Once south of Bermuda we flew southward with winds above 25 knots for days on end. June seemed to be the wind magnet and she had gust more than 40 knots on several occasions. Squalls were very common and a bit scary as winds roared and the sky went as dark as one could ever imagine - and of course the squalls only came at night - generally shortly after sunset. It appeared that we would get to the USVI in about 9 days until ... we crossed a ridge of high pressure. We were still 400 miles from our destination which was directly south and we had forecasts for south winds that should eventually become southeast. In reality the winds stayed south the entire time - a very rare situation in the NE Trades where winds from the northeast and east happen something like 70% of the time. Since weather was such an important consideration it is worth mentioning the two weather sources we had. The first was by fax from stations in Boston, Halifax, and New Orleans. We got these using our SSB (shortwave) radio linked to the computer. This required us to get broadcasts at certain precise times. 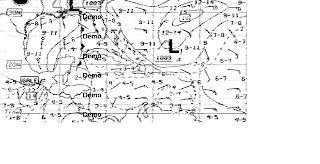 Each fax took about 10 minutes to arrive and there many different faxes available with different information for different time periods eg the 48 hour wind and wave forecast vs the 96 hour 500 mb chart. The picture below shows Bruce receiving a fax at the nav station. The SSB radio is at the top of the photo (yellow screen). A clock set to UTC (what used to be called Greenwich time) is in the upper left (everything works on UTC since people receiving the forecasts can be in many time zones. The only misleading thing about this picture is that it looks quite casual and relaxed. For most of the trip the boat was heeling and bouncing around and my left leg was braced against the engine compartment so that the computer and I stayed in one place. This is one of our weather faxes. It is a 24 hour wind and wave forecast. We were in the area near the upper right with 12 to 14 foot waves and NE winds in the 20 knot range. The low in northwest Florida is Hurricane Ida. It looped back out into the Atlantic well to the north of us and had no significant impact on us. Some faxes were much easier to read than others -largely depending on the atmospheric conditions at the time of reception. 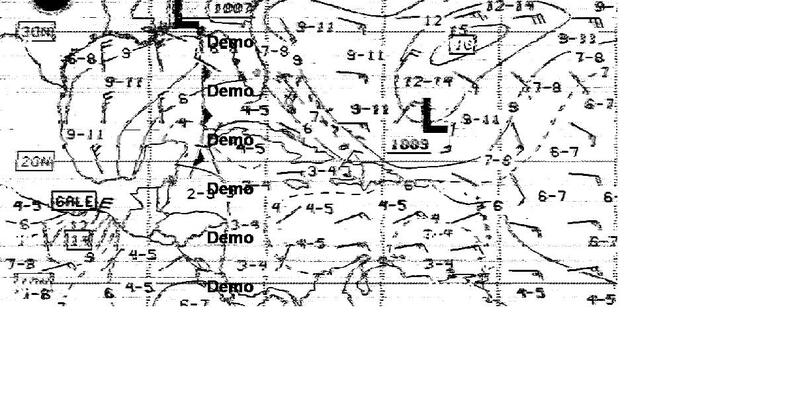 Sometimes on a 'dirty' fax it was hard to tell if the forecast was for 20 knots or 30 knots of wind. Our other source of weather information was 'Herb' who is something of a legend in the cruising community. Herb Hilgenberg lives in Burlington, ON and his hobby is providing free, personalized weather forecasts to cruisers. Each day at about 1930 UTC (330 pm where we were for most of the trip), sailors call in on their SSB radios. The first time you call you have to give your location and destination. After that he tracks you and updates your position each day. After everyone has called in Herb proceeds through the fleet (seemed to be 10 to 15 boats most days) and tells you what your winds will be for the next several days. His accuracy was surprisingly good and he is there every day and has been for more than 20 years. From the "Herb Show" (our name for the daily feature of our lives), we learned that our trip would have been very different if we had left even one day later. Boats that were about 150 to 200 miles north of us, had 48 hours of gales and most (all?) went into Bermuda to lick their wounds and get a couple of good sleeps. The problem was that unsettled weather kept them there (not a bad place to get stuck mind you) for almost a week. Perhaps the highlight of the trip was a near collision with a whale. It happened on a lovely sunny day a couple hundred miles north of St Thomas. June saw him/her/it first moving slowly but surely toward our starboard side. Its closest point of approach was no more than four meters! Perhaps it was curious, but after satisfying itself it curved just astern of us, swimming lazily on the surface the whole time. We did a bit of research and our best guess is that it was a young sperm whale, perhaps 8 to 10 meters long. Very exciting experience although we were not able to get any pictures. Less significant was that we caught one fish, a mahi-mahi that weighed perhaps 4 kilos. It provided a tasty dinner. The rest of the time it was too rough for comfortable fishing. The trip was hard on Ainia, but perhaps that is to be expected when you are sailing such a long way in somewhat difficult conditions. It seemed that everyday there was some minor repair needed somewhere. The biggest one was that the drive motor of the electric autopilot had to be reattached to its bracket. There was no sign of the location of the four bolts that had performed this task. We assumed that they worked loose and fallen to the bottom of the bilge in the aft section of the boat. How this happened was not clear. We had ongoing chafe problems with the control lines of Morley, our Monitor servo-pendulum self-steering (Fans of Vinyl Cafe on CBC will know who Morley is). These lines move back and forth a dozen times or more in a minute, hence thousands of times on the trip, often under considerable load. We had two breaks just above the water which meant lying down on the aft deck and leaning over to fix new lines. These breaks, of course, only happened at night (see picture of Burry and Bruce at work). We have now been in St Thomas for several days, doing shopping, getting the laundry done ($6.75 a load to wash), doing some repairs and figuring out what is next. We need to be in St Vincent to pick up someone on December 12th and we are figuring out which sequence of islands to visit on the way south and which to go to on the return trip north. At this point we have decided to skip the British Virgin Islands and go to St Martin for a few days. In the going south is not a casual undertaking, I was talking to a boat captain (Oyster 53) in the laundromat and he said they left Chesapeake Bay with three Swan 53s (expensive, rugged Swedish boats). Only one of the Swans has appeared in St Thomas so far and the Coast Guard are keeping a close eye out for the other two. They had a very fast passage in much more challenging conditions than ours. Posted by Bruce at 7:24 p.m.
November 26, 2009 at 8:13 p.m.